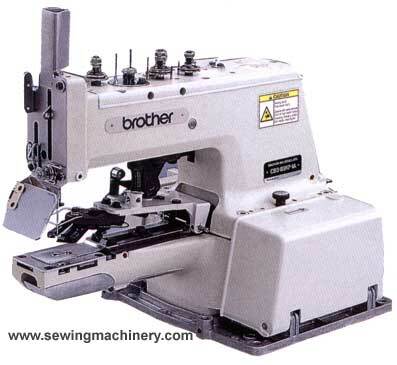 The CB3-B916A model is a universal type button sewing machine. It is ideal for use in a wide variety of applications including sewing buttons onto knitted wear, business shirts, work clothes, ladies' wear and children's wear. In addition to the smooth and quiet stopping which has been achieved through a comprehensive revision of the clutch and brake mechanisms, this machine also features an adjustable sub-tension and an improved loop spreader, which make it significantly easier to make fine adjustments to the thread tension. In addition, the B917A is equipped with a thread trimmer which trims the thread coming out from the back of the material to short lengths to produce stable seams that will not fray. The clutch mechanism and brake have been thoroughly revised to increase the range of conditions under which these models can operate, so you can sew with confidence at low and high speeds, and also at low and high temperature extremes. These improvements also ensure that stopping is quieter and more stable. The overall durability has also been greatly improved, so that you don't need to worry about problems such as brake wear. The thread take-up mechanism for knot tightening of the last needle enables stable button sewing with no fraying and from thin thread to coarse thread. The sub-tension and thread holding release mechanism is added to the type with thread cutter. Moreover, the tension control is made independent and is simplified by rotary take-up with scale and by the yarn guide of less bending resistance..